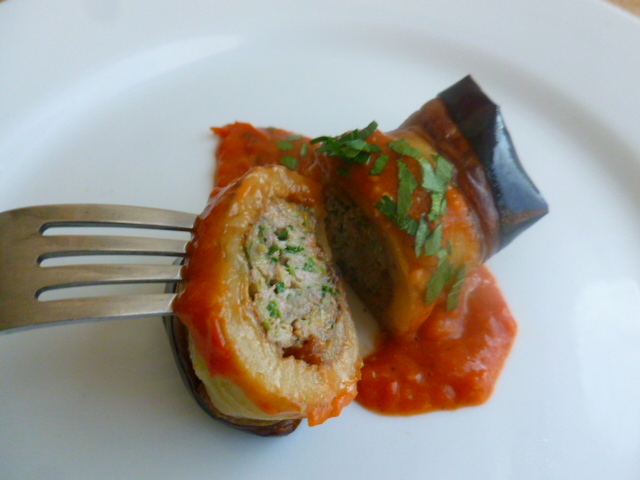 The combination of eggplant and lamb meat is one of my favorites. In the recipe here, the patties are fried in the last minute and the dish is assembles in before serving. However, the rest of the dish can be prepared in advance, so the process is not as daunting as it may seem at first glace. Once you have the sauce, the fried eggplants and the patties mixture ready, finishing the dish and assembling is quick and easy. The dish is ideal for serving as a part of a buffet dinner, as an appetizer, or as a main course. Whichever way you’ll choose to serve it, I’m sure you’ll enjoy this tasty combination of flavors. 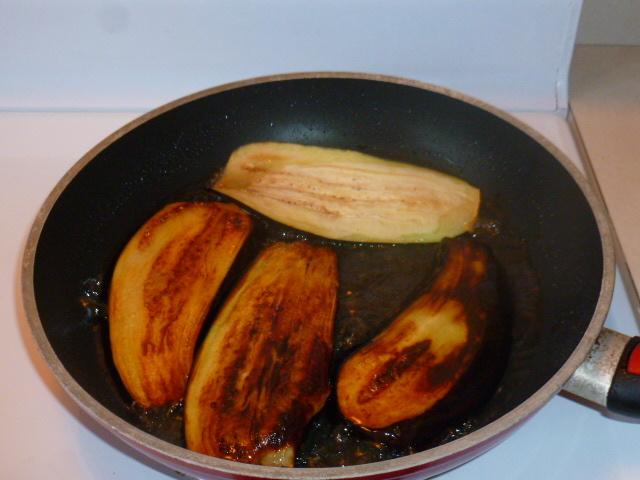 * Salting the eggplants overnight is important, as it helps the eggplant to hardly absorb oil while frying. For best results, don’t skip this step. * To ensure quality and best flavor, I recommend chopping or grinding the meat at home. * Beef can be used instead of the lamb. * For a vegetarian option, use herbed goat cheese instead of the meat. 1. 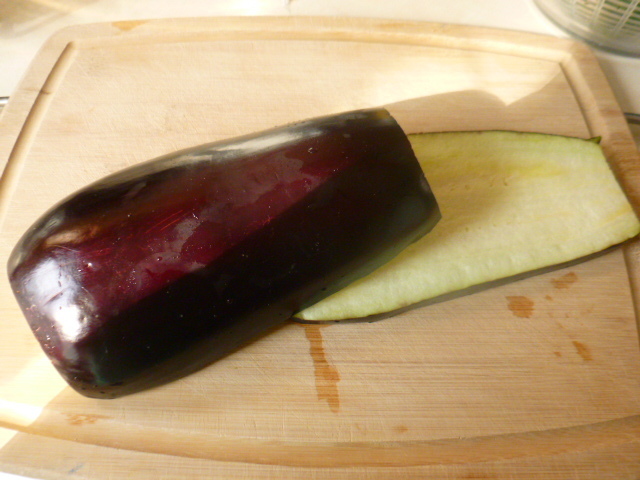 The eggplants: Sprinkle the eggplant slices with salt on both sides. 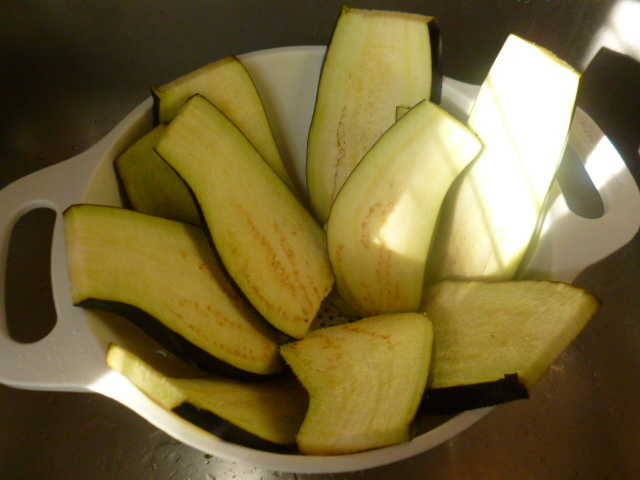 Place in a colander, as shown in the photo, and let sweat and drain overnight. 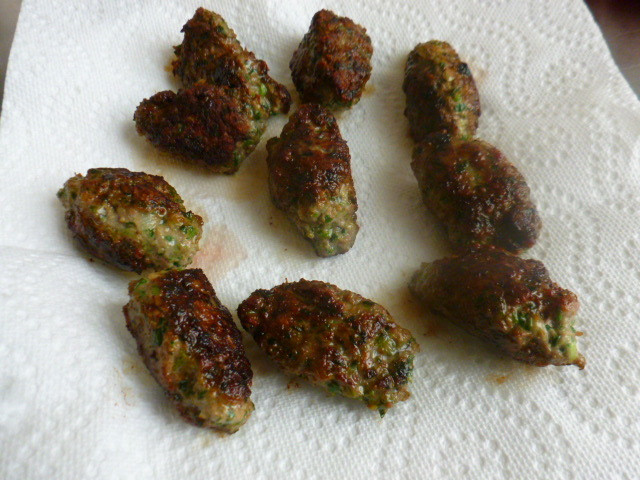 The next day, pat dry with paper towels and fry in hot oil until golden-brown on both sides. Place on paper towels, to adsorb extra oil. Keep at room temperature until using, or, in an airtight container in the fridge, for up to 3 days. 2. The sauce: Preheat the oven to 425F (220C). 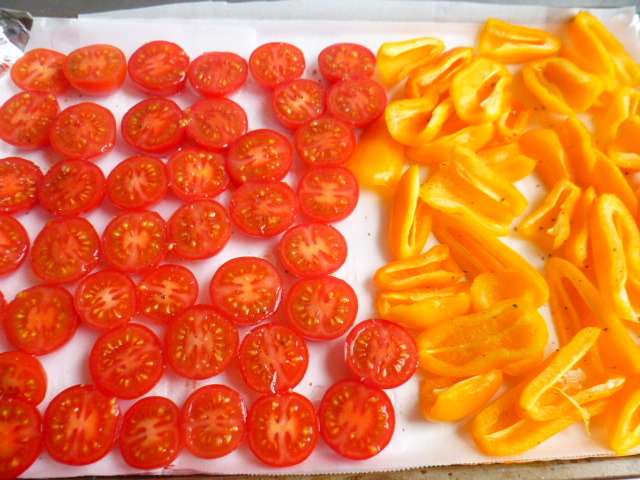 Line a baking sheet pan with baking paper. 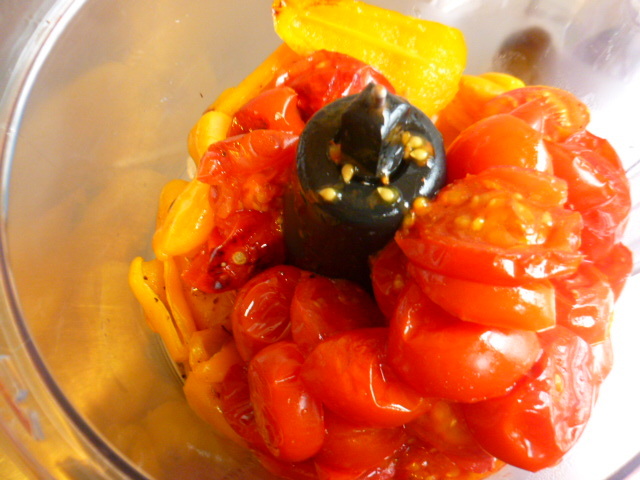 Place the peppers and cherry tomatoes in the pan, in one layer, and sprinkle with salt and pepper. 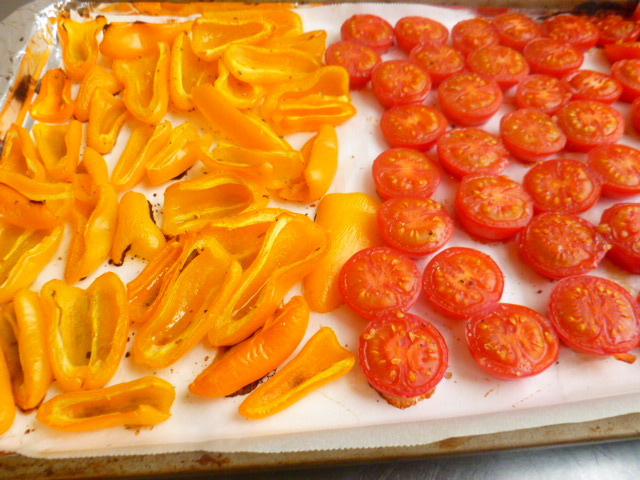 Drizzle 1 Tbs olive oil all over and roast for about 20 minutes, or until the tomatoes and peppers are nicely roasted. 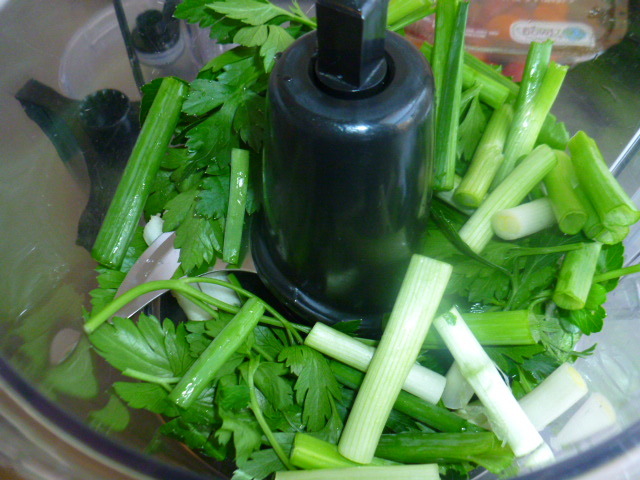 Let cool a bit and place in a food processor bowl, fitted with the metal blade. Add the remaining 1 Tbs of olive oil and process coarsely. Taste and adjust seasonings if needed. 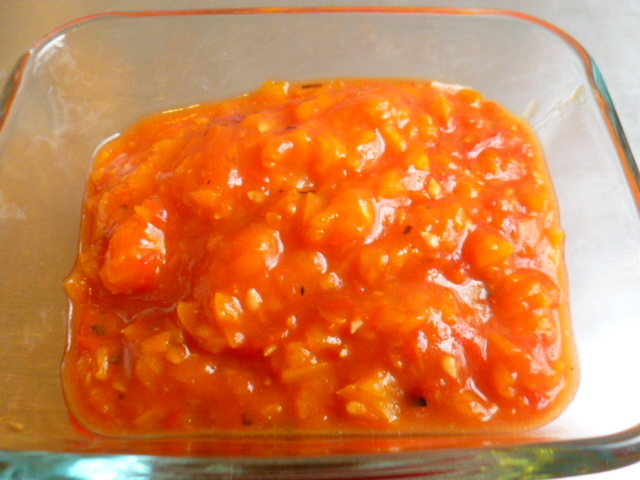 The sauce can be kept, in an airtight container in the fridge, for up to a week. 3. 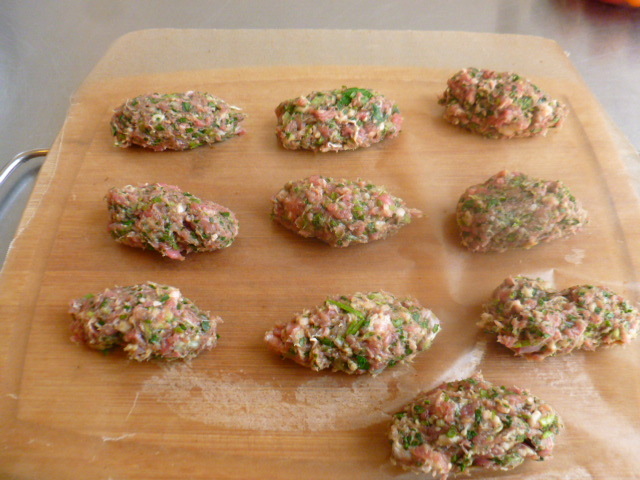 The patties: Coarsely chop the parsley and scallions in a food processor bowl, fitted with the metal blade. 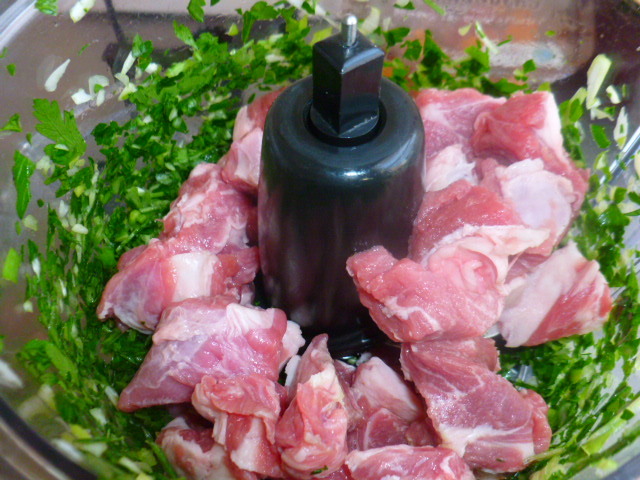 Add the cubed meat and process again, to coarsely chop the meat. Add the salt and pepper and mix. Create 10 medium size oval patties from the mixture. 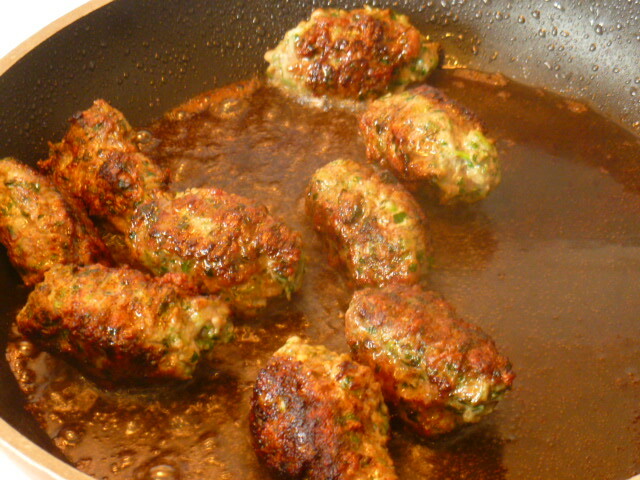 Fry in hot oil until the patties are golden-brown on all sides. Place on paper towels, to absorb extra fat. Keep warm until using. 4. 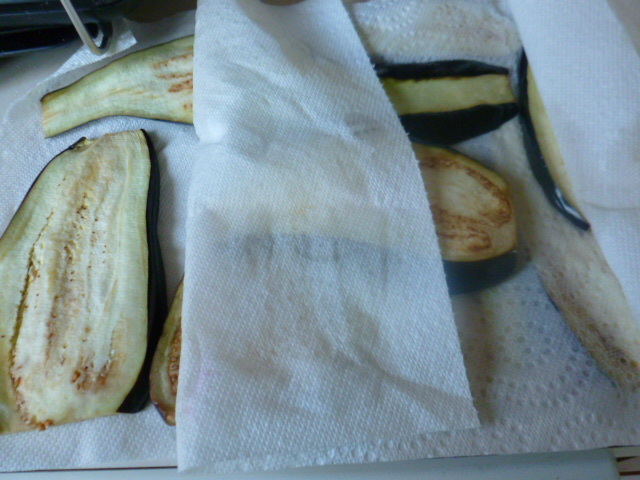 Assembling: place 10 fried eggplant slices on a work surface. Spread 1 Tbs sauce over each slice, and add the patties. 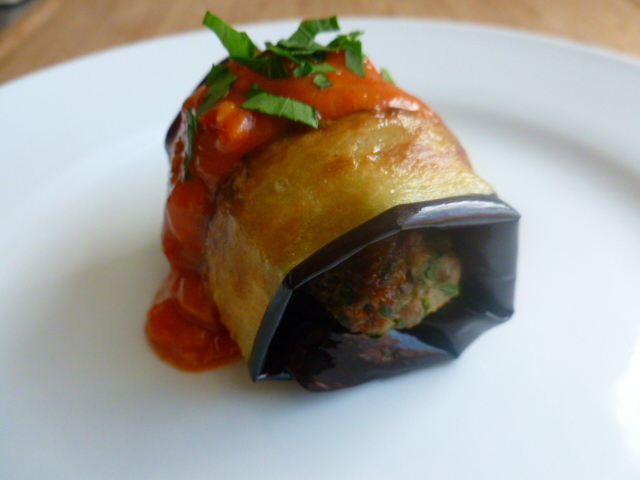 Roll together and place on a serving plate. 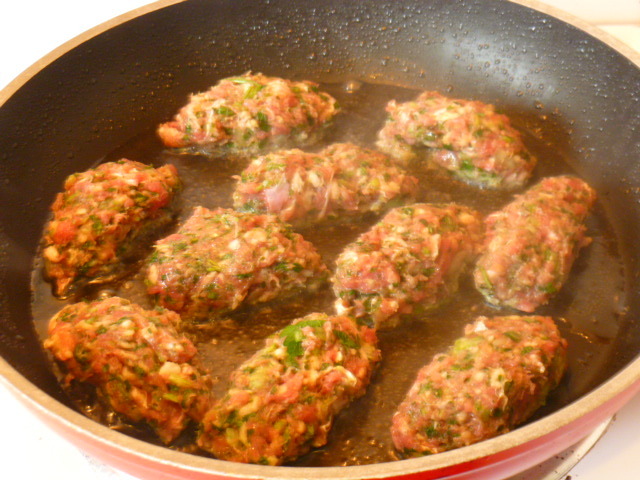 Add some more sauce on top, sprinkle with chopped parsley and serve. Wow what a great combination! This looks amazing! OMG. Not only are these beautiful but they’re so fun! And served warm with cocktails they’d just be such a wonderful hors d’oeuvres! Irresistible! Mouthwatering in front of the computer…. What a great combination of ingredients! :-) Very tempting! Two of my favorite foods – this sounds wonderful! Thank you,Ronit. 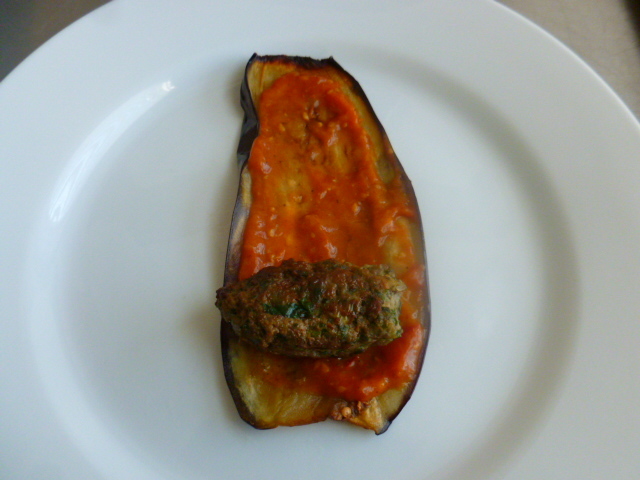 Fantastic recipe, Ronit! What a treat! Sounds and looks interesting. 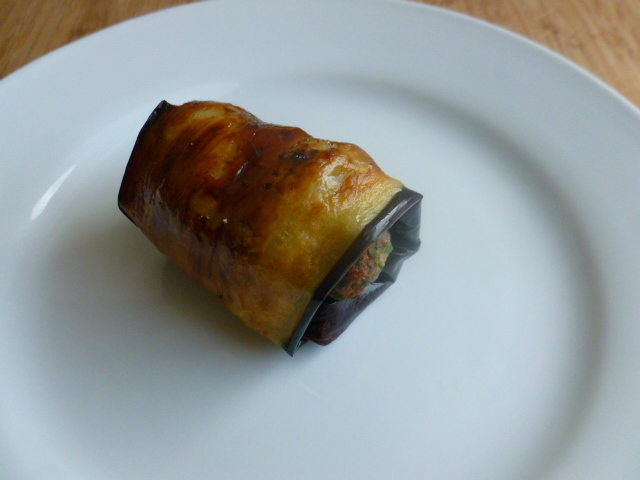 Love aubergines. Such a delightful way of bringing so many wonderful ingredients together! 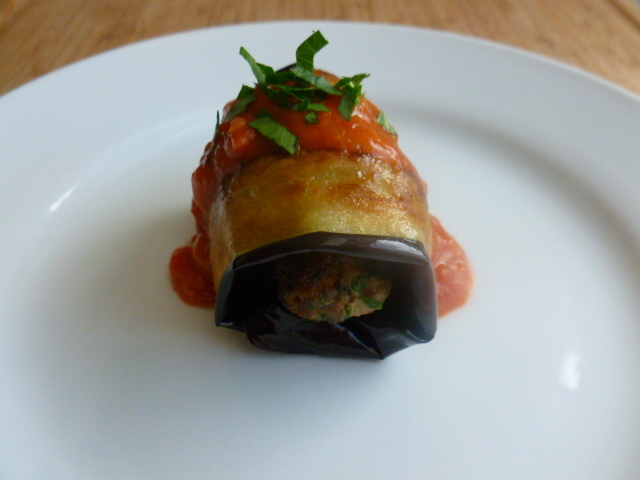 What a great idea to stick lamb kebabs into an eggplant rolatini! All the other stuff should lend it so much flavor. I hope you are having a beautiful Pesach, Ronit! Love egg plant! The way you treated it with salt sounds interesting. I have never tried that way. Beautiful share Ronit. Thanks for this tip Ronit. 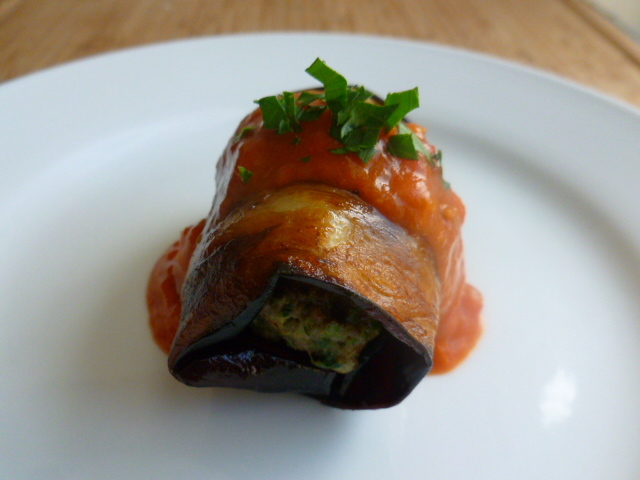 You may find this hard to believe but I have never had eggplant. I need to give it a try! This looks amazing!!!! must be delicious.. I waill try this soon! !